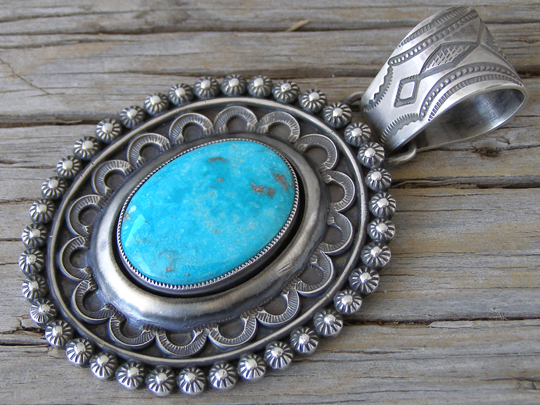 Calvin set a perfect oval of natural, untreated Candelaria turquoise from Nevada in this finely serrated bezel which he so carefully makes for most of his pieces. Because this is a perfect oval, he makes this a design of perfect symmetry in reiterating the oval in concentric forms surrounding the stone. This is splendidly detailed work which shows the soul of the artist. Exquisite! The bale on this will accommodate Erma Arviso's antiqued Sterling beads up to 10 mm. diameter. Dimensions of pendant (excluding bale): 2 1/8" x 1 3/4"